Those of you who follow us on Facebook might have seen that over the weekend my family enjoyed our first ears of sweet corn this summer. Along with a few other foods, fresh corn just says summertime to me. This is one of those dishes that I only make when I can get fresh corn; frozen just doesn’t do it justice. I’m looking forward to getting some fresh tomatoes also, but grape tomatoes work great until I get my hands on some fresh. If I’m making this for a dip, I will quarter the tomatoes so they are a little more manageable, but as a side salad I love them halved. Add the 3 ears of corn, cover and bring back to a boil. Turn the heat off, leaving the pot on the hot burner. Let the corn cook for 5 minutes. Remove the corn and set aside to cool. When cool enough to handle, use a sharp knife to cut the corn off of the cob. Cover and place in the refrigerator until cooled. 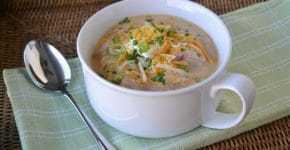 Place the tomatoes, green onion, and cheese in a bowl. Make sure it is cool or it will melt your cheese. In a small jar, combine all the dressing ingredients and shake well to combine. Pour over the tomato mixture. Place in the fridge for 2-3 hours to allow the flavors to blend. Right before serving add the diced avocado and stir gently to combine. I like to add my avocado right before serving so it is bright and fresh looking. 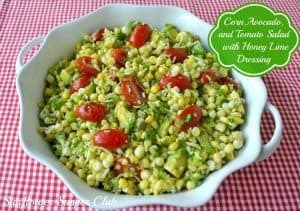 Check out my recipe for Chipotle, Corn, and Avocado Salad for how I dice my Avocados. I sometime use pepper jack cheese if I want to give this a little kick! This looks like it would be awesome. Definitely will have to give this a try, something I think my family would enjoy for sure. Love the pepper jack suggestion, your photo and recipe…and might try roasting the corn…is now on my list to do! I can almost taste this awesome salad and can’t wait to try it. Hope you are having a great summer weekend and thank you so much for sharing with Full Plate Thursday.